In the above line, we have set the minimum heap size to 1GB and maximum heap size to 2GB. On a 32-bit JVM, the largest heap size you can theoretically set is 4GB, but in practice, you will never see that level. Practically, you will get around 1.5GB in 32-bit Windows, 2.5GB on 32 bit Linux and slightly more on 32-bit Solaris system. To use a larger heap size, you need to use a 64-bit JVM, where you can theoretically set quite a large heap space. See this article for learning more about maximum heap size of a 64-bit JVM. The -d64 flag is important as this tells the JVM to run in 64-bit mode. See here to learn about some more important JVM arguments, every Java developer should know. If you are experienced Java developer then it's also expected from you to know more about JVM, Garbage collection and how to tune both JVM and Garbage collection. You should also know about tools like a profiler, heap dump analyzer to troubleshooting application performance issue. 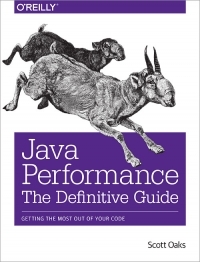 If you want to improve your JVM and GC tuning skill then you should check out Java Performance The Definitive Guide By Scott Oaks, one of the must read a book for experienced Java programmers. Enter -Xmx1G, to set the max size to 1GB. You can also use M or K, which stands for Megabytes and Kilobytes for example -Xmx256M means maximum heap space would be 256 Megabytes. 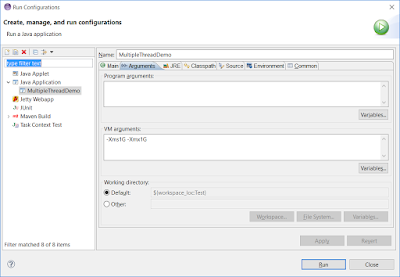 Step 1: Go to the Run Configuration of Application or Program for which you want to increase the heap space. 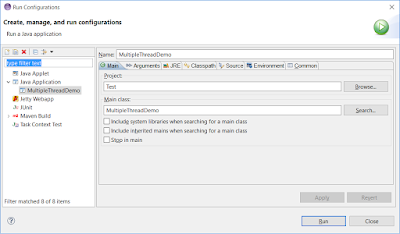 Here we are increasing heap size of MultipleThreadDemo application which is run by the Main class MultipleThreadDemo, as you can see in configuration. Beware not to add the JVM arguments at the Program Arguments text area, that's for program arguments e.g anything you want to use to program using -D e.g. -Dversion="1.0"
2. Make sure there is no space between -Xmx and 1G e.g. -Xmx 1G will also throw invalid heap size error. 3. One more common mistake you need to avoid is using suffix like GB, MB, and KB instead of G, M, and K, those will also result in could not create the Java Virtual Machine error. That's all about how to increase heap size of Java application running on the Eclipse as well as on the command line.